We are one of the leading manufacturers of a wide range of Polycarbonate Base Dome for wide ranging industrial and other applications. Our Polycarbonate Base Dome are manufactured using Vacuum Thermoforming Machines. We manufacture all sizes and shapes of domes. With the valuable assistance of skilled team of professionals, we are engaged in offering an extensive range of high-quality FRP Hemisphere Dome. Being one of the renowned firms in the industry, we are involved in providing a high-quality array of Fiber Dome. 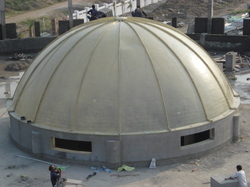 The FRP Hemisphere Dome With Spiral Group is a regular and popular product from the Shashi engineers. It could be customized and sold for various industries at base prices. CSIR Bhopal has been our regular client for Hemisphere dome with spiral group for its lab peripherals and testing. The prices for this component are reasonable. In compliance with industrial quality standards, we are highly engaged in providing a superb quality assortment of FRP Domes. We manufacture and designs FRP based dome for commercial and residential projects.